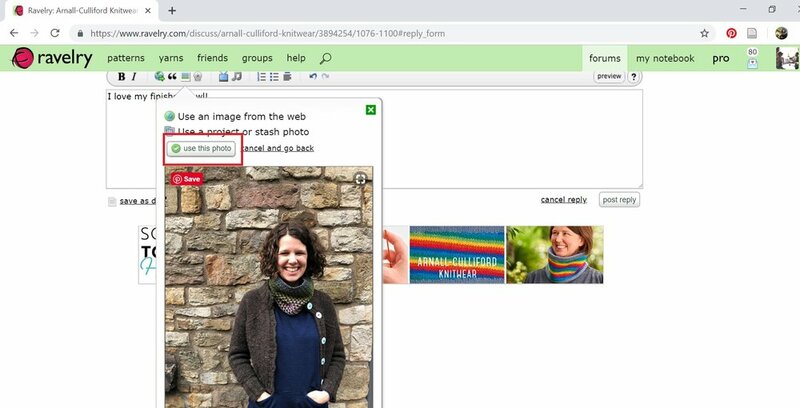 Last week, we talked about how to add photos to your Ravelry project page. This week, I’m going to take you through how to share these photos in a Ravelry forum if you, say, want to ask a question about your progress or show off your finished object in the knitalong threads! First things first, you’ll need to open a reply to the thread. There are a few places you can do this — they’re boxed in red (above). Once, you’ve hit reply to thread, you’ll have a compose box with several options. To add a photo, you’ll want to click the icon that looks like a little photo (outlined in red). Ravelry cleverly brings up your most recently added photos — here, I’ve selected my finished object photo of my Bramen Cowl. 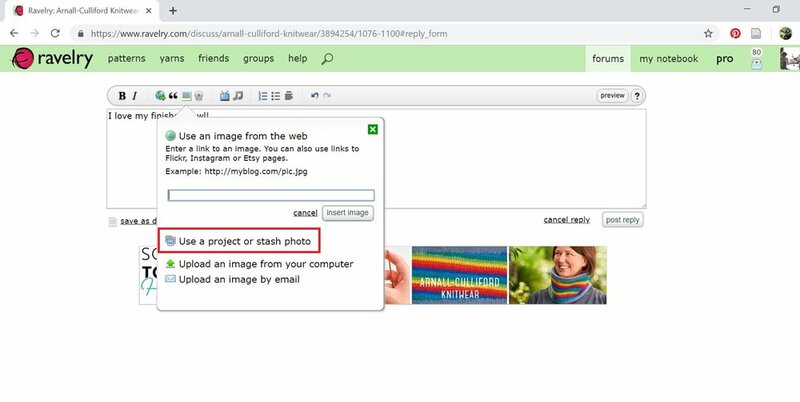 If you are trying to share photos that you added awhile ago, you can click “older photos” or even search for a particular project using the search bar above the thumbnail images. Once you’ve found the photo you want, click it. Ravelry then adds some code into your reply that makes your photo appear when you post it. At this point, you can add any additional text to your reply you want (or more photos!) — just make sure you don’t delete the string of information that Ravelry’s popped into the message! When you’re done, click post reply, and your message with image will be posted in the thread! And that’s all there is to it! If you’ve been knitting along on your Bramen cowl (or any other project, for that matter) and would like to try sharing a photo for the first time, why not pop over to the Ravelry group and give it a go! And if you have a burning Ravelry question, let us know and we’ll see if we can help!